I recently took a cycling vacation with my husband in the mountains of northern New Mexico. I count on vacation as an excellent time to go have an adventure, do something different, get out of my office, and maybe get out of my clinical head. 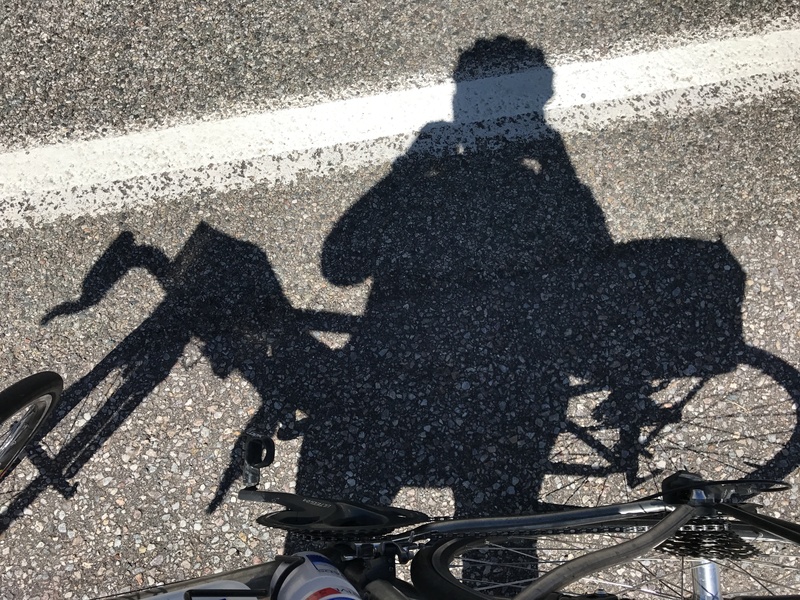 I was mostly able to let go of work worries and really enjoyed the week-long escape; however, I must admit that I found myself periodically circling around the idea that there are some connections between cycling and the eating disorder recovery process. Highlighting a handful of common cycling terms and rules of the road, several significant “lessons” can be underscored for consideration. Some of the common language used among cyclists might be found to be a helpful, playful way to approach the peaks and valleys of the ED recovery road (not to mention life in general). And, many of the cycling concepts also happen to make good psychological sense. As implied, this utterance is a humorful way for cyclists to remind someone to get on their helmet if it’s missing and highlights the fact that protecting the brain is of primary importance. Not only are helmets the law in some states, but many cyclists will refuse to ride with anyone not wearing a helmet. It has become common knowledge that abrasions and broken bones heal much more easily than head injuries. Using the granny gear references the use of lower (and easier to pedal) gears, presumably named after the gear that grandmothers are believed to use most frequently. The low gear ratio, combining the small chain ring with the largest cassette cog, is mainly used for steep climbs but can be used any time that the work load needs to be lessened for whatever reason. Similarly, in treatment, it’s helpful to know when to simplify, how to streamline, and if one needs to slow down. The process of facing the ED recovery journey day in and day out can be excruciating. Sometimes the fast pace of last week or even earlier in the day is no longer possible. Finding and practicing ways to infuse more of a gentler, kinder approach to the forward motion is necessary. This might come in the form of lessening perfectionistic expectations for homework task completion or in purposefully increasing the compassionate self-talk when approaching steps of healing. If pedaling suddenly feels too demanding, it makes sense to find ways to make the work load more manageable. When riding in a group, drafting is the term to indicate a method of rotating whereby bikers take turns riding up front for a bit (called pulling) before peeling off to the back of the line to tuck in closely behind another rider. Some rides might have all of the riders in the group rotating, yet other rides include only a small subset of the riders pulling at the head of the line. By drafting like this, another rider is making maximum use of another’s slipstream, reducing wind resistance and lessening the energy expenditure required to ride at the same speed. Drafting in the ED recovery process might mean getting into treatment, letting family members help in substantial ways, or telling friends about the support that would be appreciated. The process of drafting or leaning on others is often quite difficult for those with EDs, as many of these highly functional, smart, conscientious individuals are not accustomed to letting others help them in meaningful ways. There is often a misaligned belief that one should do it alone. Yet, drafting in some form or another is a part of most individuals’ recovery journey, as the road is long and arduous. Allowing the energy, experience and enthusiasm from others to serve as a form of “wind resistance” is temporary but can be life altering. This is cycle speak uttered to someone who might be falling behind the group; they are told to “zip it up” in order to pull back into the group. Such a phrase might be hollered tersely to the biker in the back, but it is generally meant to call attention to the gap and to positively encourage the rider to stay with the group. There is safety in numbers and fun in the camaraderie of a group in rhythm. Zipping it up with EDs might mean attending honestly to signals when progress gaps are widening in subtle but significant ways. This could be demonstrated in various behaviors, ranging from mom noticing when there are suddenly more excuses being made about the meal plan or the therapist observing an abrupt increase in body checking throughout recent sessions. Families, friends and clients themselves might be coached in finding ways to be more attentive to times when someone is falling behind in challenging one’s self, zoning out more often or isolating more regularly. Identifying this gap directly, with diplomacy and kind reinforcement, is key. The individual can then invited to find ways to come back into the protective fold of the support team group for the purpose of preventing even more distance, disconnectedness and falling out of sync with forward movement. When biking certain roads, particularly in mountainous regions, there can sometimes be a visual perspective that one is riding on flat ground yet it is sometimes discovered that there is a slight uphill incline (often 1-2% grade). This type of surprisingly difficult section of road can be a frustrating optical illusion of sorts, especially as the effort being expended doesn’t result in the progress and the speed that would be expected. This can lead a biker to feel discouraged because the ostensible flat surface is much more difficult than is assumed it should be at first glance. Similarly, in eating disorder recovery, there are numerous false flats. There are many times when a suggestion or encouragement to try a new behavior or test out a new belief seems like it should be fairly easy but turns out to be deceivingly difficult. This isn’t a sign of the individual being silly, incapable or weak; this is indicative of some steps that are much harder than they appear. Perspective, pacing and periodic breaks are all required. At the start of every journey, pump up the tires and fill the water bottles so you aren’t starting at a disadvantage. Fuel up with food to avoid bonking, the uncomfortable and unfortunate experience of running completely out of energy in the middle of a ride. Carry a little money, extra snacks and a spare tire tube, as one never knows when extra reserves might be needed. Watch out for gravel and other debris on the side of the road as it can destabilize you. Headwinds stink, but they are generally temporary. Sticky brakes and dropped chains need not be ignored; stop and fix these before going further. Utilize rear view mirrors wisely, allowing you to keep an eye on what might be coming from behind but don’t let it overtake your focus on where you are going. Use hand signals and verbal cues to let others around you know where you are going and what might be needed in the situation. Remember that periodic interval training can build overall strength by alternating brief, hard efforts with periods of rest and recovery. Change cycling groups as needed rather than strain excessively to keep up a tempo or conversation when it’s no longer working. Wear those spandex biking shorts proudly, as bodies are what they are and work better with a little padding. When the going gets tough, take it one pedal stroke at a time. These specific double meaning phrases might not really be helpful or relevant for many clients, but when I attend to parallel connections in my own hobbies, I am building therapeutic dexterity for myself. I play with an idea and look for ways to increase my empathy, my perspective and my ability to maybe explain a concept just a little more clearly to others. Clinicians sharing metaphors with each other can help to build our collective repertoire of skills, knowledge base and creative problem-solving. And, even on those cycling excursions when my mind is more blank, I know that getting on my bike, being out in nature, and experiencing an activity in flow helps to infuse rejuvenation. That’s what I would call full cycological benefit. The opinions and views of our guest contributors are shared to provide a broad perspective of eating disorders and not intended as endorsement by iaedp Foundation or its Board of Directors.